Theatrical design services for the professional and educational arenas. Structural, Scenic, Special mechanics and Practical effects. We serve other theater-based businesses, schools, Special event Companies, and the General public. We can help out with the tricky and the tedious jobs handed over so you can focus on the bigger project, or we can tackle the beast single handedly with our talented crew of fabricators and makers. Converting Paper-Craft files to steel parts is the ‘Why’ that started it all. 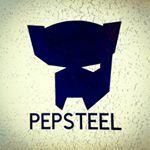 This is where PEPSTEEL got it’s name. COSPLAY inspired Tech, we sought out to create real structurally-inspired additions to everyday life and it’s various tasks. Making cool things real, and making real things cool. Large format CNC Metal/Nonmetal cutting laser. 4’X8′ cutting area. Let us help you make your next project as best as it can be.